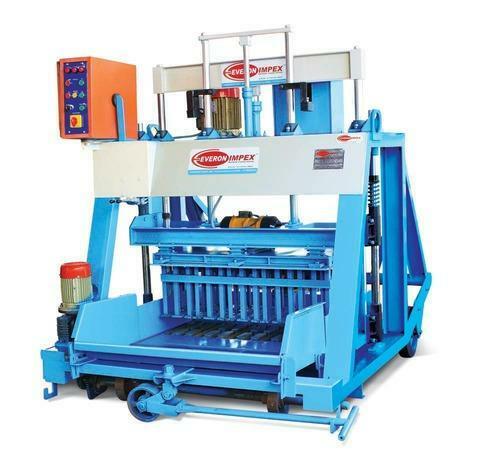 Cement Brick Making MachineRs.1, 65 lakh/number This is cement brick making machine an egg laying type hydraulic operated cement Block Making Machine on wheels, Which will lay block on the concrete Floor and move to the next laying. Any type of concrete blocks can be produced with Consistent quality by fixing different types of concrete mould and ram in the machine. This is cement brick making machine an egg laying type hydraulic operated cement Block Making Machine on wheels, Which will lay block on the concrete Floor and move to the next laying. Any type of concrete blocks can be produced with Consistent quality by fixing different types of concrete mould and ram in the machine. Established in the year 2011, We, at, "Everon Impex" Manufacturer and Exporters a varied range of Construction and Concrete Block Machines that offer critical solutions to requirements of construction industry spread across the country. The comprehensive range of our products meets every requirement of construction and building industry. Our product range consists of the categories such as Concrete Block Machine, Solid Block Making Machine, Paver Block Making Machine, and Cement Brick Machine, etc. Under these categories, we offer an exhaustive range of construction machines. The range offered by us is manufactured by using advanced technology that makes machines precision engineered, dimensionally accurate, hard wearing and an excellent performer. We are supported by a cutting edge infrastructure facility, out fitted with tools, machines, and amenities that are of international standards. The infrastructure comprising manufacturing unit, quality monitoring and R&D unit, warehouse facility has requisite provisions to address our comprehensive business agenda. The heavy outlay on the infrastructure has been worth while as we have recovered the investment many times over with high revenue earned and critical client appreciation. Our major markets are East/Middle Africa, Middle East, South East Asia, Indian Subcontinent, South/West Africa, North Africa, South America.